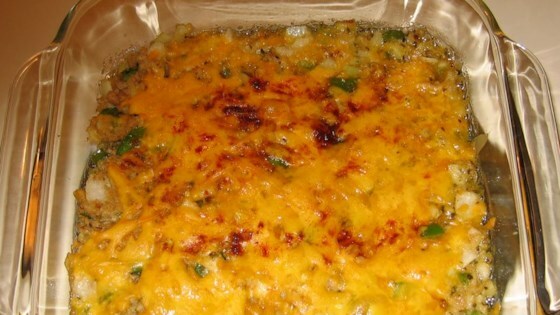 "Yummy hot clam dip. The clams aren't that noticeable, even for someone like me who is not a clam person. Delicious served on crackers." Combine minced clams and lemon juice in a small saucepan. Bring mixture to a simmer. Simmer for 15 minutes. In a medium-size saucepan, combine butter, onion, green bell pepper, parsley, oregano, hot sauce, and red pepper. Stir vegetables over a medium-low heat until butter or margarine is melted. Mix in the clams and breadcrumbs. Pour mixture into an ovenproof baking dish and top with 1/2 cup shredded Cheddar cheese and sprinkle with paprika. Chef John gets the party started with his clam chowder dip. it was "OK"...party goers seemed to like it but I thought it was more a baked clams recipe. It would be GREAT in clam shells and baked! Everyone loved it. They asked for the recipe if that tells you anything. This is one of my favorite appetizers. Whenever I make it, I get compliments. It's especially good with an additional half chopped red pepper. This is an amazing recipe!!!! Everyone always raves about it when I make it. Sometimes I double the recipe and makes stuffed mushrooms from the second batch. I have been making this recipe for years and for the people who thought it was too bland, I always add a large minced garlic clove when I saute the onions and veggies.